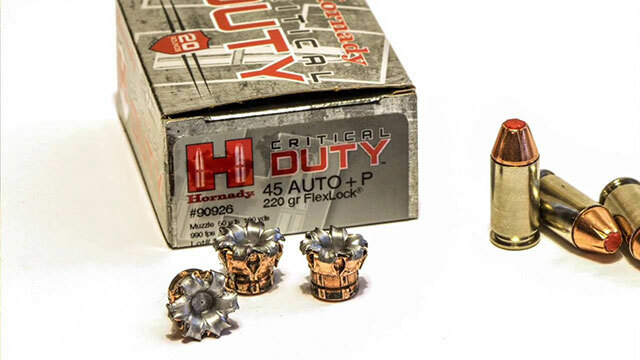 Of the major lines of defensive ammunition, two very popular brands by Hornady are Critical Duty and Critical Defense. Both are very popular brands of ammunition, available at many gun stores and sporting goods stores. If shopping for defense ammo, whether picking a brand to carry or looking to try some out, they are well worth the consideration. Here's what you need to know about them both, as there are some differences that you should be mindful of. 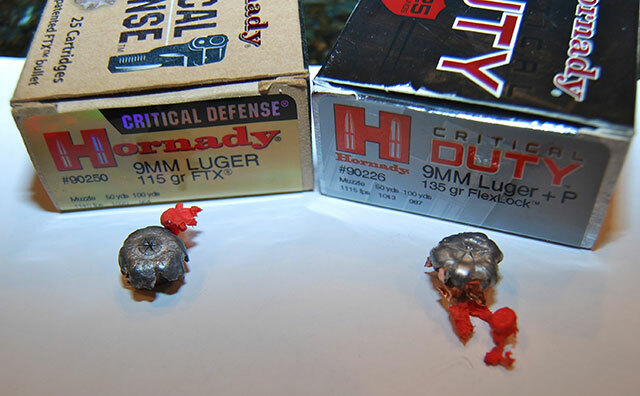 Hornady's Critical Duty line was purpose-built for passing FBI ballistic testing protocols. It is designed to offer a balance of expansion, penetration and also weight retention when passing through barriers. Hornady also designed it for service guns, so if you were to load it into a subcompact pistol and shoot into gelatin, you might not be impressed. Granted, that shortcoming is something of a known quantity; 158-grain .38 Special LSWCHP bullets were known for performing perfectly out of Model 10s and other service revolvers but poorly out of snubbies for many years. 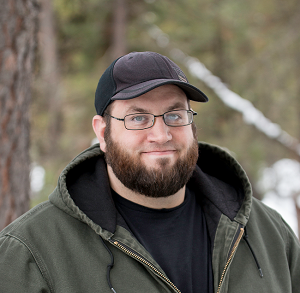 Speer created a short-barrel load, and other producers have followed suit. To do this, Critical Duty uses a belted, bonded hollow point bullet - which they call the FlexLock - with a polymer insert. (It even has a little "H" on it.) For more reliable penetration into tissue and through barriers, Critical Duty ammo uses a little less material in the core to have a heavier jacket despite the same popular grain weights of bullets. The core is dovetailed into the jacket, giving the bullet a strong bond, which is further enhanced by the InterLock band. The polymer insert prevents anything from clogging the hollow point, such as clothing or other material, which is a common cause of failure to expand. The polymer insert also helps exert hydraulic pressure on the core of the bullet, further aiding expansion. The propellant has also been formulated for less flash and fouling in the barrel. And it worked. Critical Duty handily passed the FBI protocols and has since become a very popular duty round, with a track record of good performance in the field. In fact, the FBI issue it. 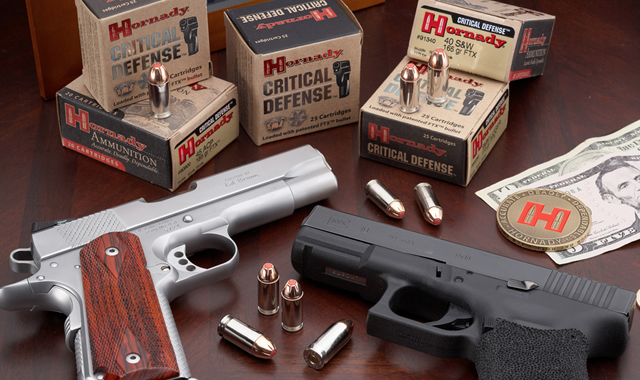 Hornady Critical Defense shares a similar feature, in that it's a hollow point bullet with a polymer insert, but it's been designed for use in compact concealed carry pistols. However, the bullet itself is of a different design as the intended use of Critical Defense is different than that of Critical Duty. The latter was designed from the ground up as a duty round, intended for use in full-size pistols. The former was designed for use as a concealed carry round, intended for use in compact and subcompact pistols as they are more commonly used in that role. Critical Defense ammunition uses the Flex Tip, but employs a different bullet design in terms of the jacket. Whereas the core of Critical Duty is dovetailed into the jacket to create a bonded bullet without chemical bonding, Critical Defense is a traditional cup and core hollow point with a polymer insert. The Critical Defense bullet is still banded, which reinforced the jacket but also cuts down on fouling. Hornady selected propellants to reduce recoil and muzzle flip, so you might notice a touch more flash than with Critical Duty. The banding and polymer insert keep Critical Defense from breaking up as easily as other traditional cup and core bullets, of which that was a common failing. Penetration through lighter barriers such as heavy clothing is also assisted, as is expansion just as with Critical Duty. Should I Carry Critical Defense Or Critical Duty? Obviously, Critical Defense ammo is going to be the first, best fit of the two for most people. It's designed for the concealed carry market, with short-barrel pistols in mind. You're also - and this is important to bear in mind - probably going to find it in more gun stores. Not that you won't find Critical Duty, but you're going to find Critical Defense more. That's something to bear in mind, as finding a box of Critical Defense 9mm ammunition may be easier for you than finding the duty version. If you carry a full-size handgun (and plenty of people do conceal and carry a service pistol) then Critical Duty is also a very viable defense round. That's the platform it's designed to run on. Therefore, you'll get more performance out of the Duty round if you're carrying a full-size gun, so that's at least something to bear in mind. Hornady is one of the best ammunition makers out there. They are known for making accurate, reliable and innovative ammunition, and for more than just the defensive market; the hunting set has taken to Hornady LeveRevolution and Superformance ammunition as well. These bullets have become some of the most popular carry rounds for civilians and officers alike despite only being on the market about a decade, so either is a solid choice for defensive ammunition. However, there is a slight caveat to be aware of. The FlexTip bullet design requires the case length be trimmed slightly. 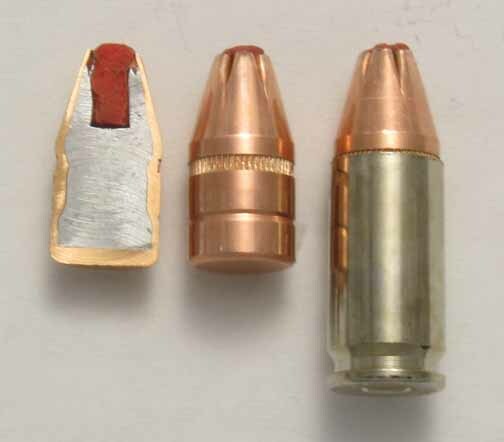 If you take a Critical Defense bullet and compare it to, say, a Federal HST or Speer Gold Dot round of the same caliber, you'll notice the brass is a hair shorter. This is also true of Hornady's LeveRevolution rounds. For most guns, this isn't an issue. That said, any experienced shooter knows that some guns "like" some ammo better than others. Some guns won't cycle Critical Duty or Critical Defense as well as other bullets due to the case length, usually having to do with the design of the feed ramp. Therefore, if considering carrying this round, make sure your gun digests it well first. What Is The Shelf Life Of Ammo?